How does BBBEE actually impact small to medium sized enterprises in SA? Over the five years to 2013, small firms in SA have shed over 1m jobs. Most of these have been lower-paying jobs occupied by young people. His comments support a recent report by the Johannesburg-based business environment specialists Small Business Project (SBP), which showed that small firms spent an average of eight working days a month dealing wth red tape. The report identifies taxes, labour and BEE issues as the most time-consuming factors. The findings are in the November small business report titled "Examining the challenges facing small businesses in SA", by Johannsburg-based business environment specialists SBP. A recent survey conducted by the Small Business Project (SBP) entitled Examining the Challenges facing Small Businesses in South Africa indicated that SMEs lose out on a week's worth of income per month while trying to sort out red tape or comply with regulations. Five months after the creation of the Small Busness Deveopment Ministry, touted as a solution to SA's unemployment problem, its effect is yet to be felt. Statistics SA says 24,1% of South Africans are unemployed. The situation has been the catalyst for many people to venture into entrepreneurship. The National Development Plan (NDP) envisages that SMEs will create 90% of the 11 million new jobs the government says can be created by 2030. However, the broad impession of the business environment held by respondents to the February SME Growth Index was not positive - 71% said that it became harder to operatea business in SA last year. Only 9% said it had become easier. All is not well at the bottom end of the business chain, despite the fact that the National Development Plan identifies this part of the economy as the best guarantor of growth and jobs. Sales are now starting to recover, but job growth remains stubbornly low. In an auditorium at the Johanneburg Zoo, Neil Rankin, a Stellenbosch professor, reels off statistics that explain the "jobless growth" problem besetting small business in the country. 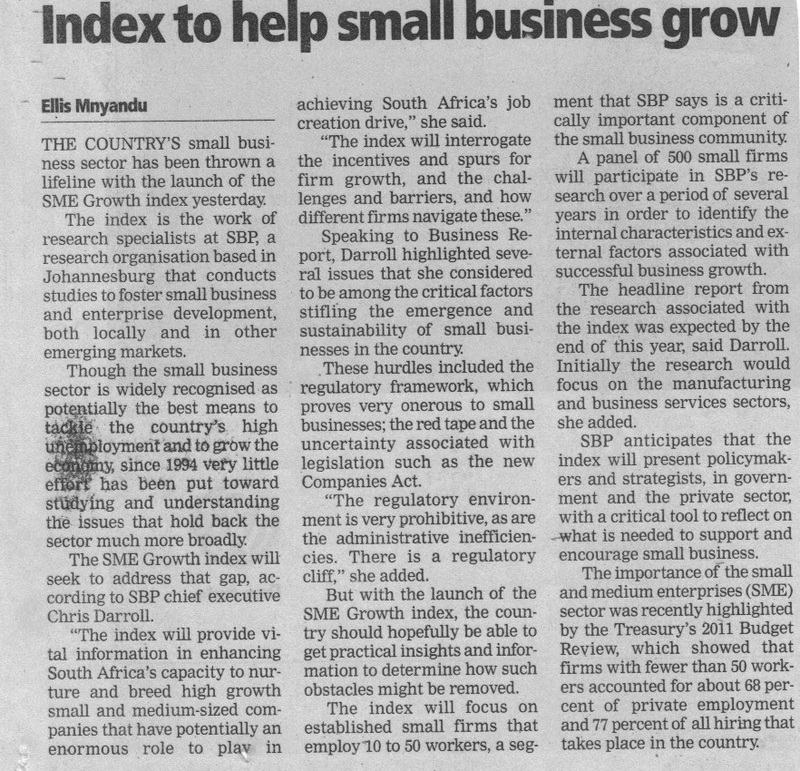 SBP's CEO Chris Darroll discusses findings of 2013 SME Growth Index - Are small firms alive and kicking or just kicking? Everyone agrees that the biggest challenge facing South Africa is joblessness. This is usually put down to years of "jobless growth" during which the economy has improved, but the unemployment rate has remained stubbornly high at 25%. Worldwide best practice holds that business fares best in a clear, navigable regulatory framework. In this respect SA seems perversely intent on discouraging business. Red Tape is not a peripheral concern. According to our SME Growth Index, the average small enterprise is spending about 4% of its turnover on compliance with regulatory demands. 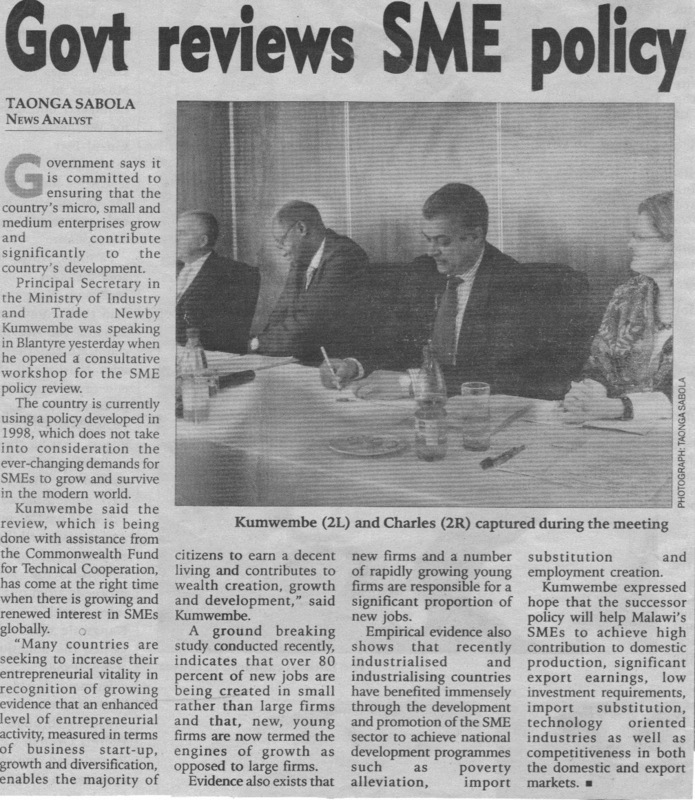 The importance of an enabling environment for SMEs in South Africa was highlighted when CNBC Africa featured SBP's SME Growth Index on their programme flighted in June 2013. If SA wants small businesses to generate the jobs it desperately needs, it needs to get serious about setting in order the administrative, educational and social systems that will make this possible. The growth and survival rates of small businesses, which are meant to help create jobs, have been dismal in spite of numerous support programmes. This cover story in the Financial Mail examines where the pitfalls are and what SA needs to do to avoid them. Critics take issue with an 'unworkable' plan to licence even the smallest of businesses. UP TO 6% Turnover spent on red tape. Small and medium enterprises (SMEs) are finding it difficult to prosper and have increasingly reverted to survival mode over the last year. According to SBP's SME Growth Index released yesterday, of the 500 SMEs interviewed, 74% stated that the environment that they operate in has become more challenging. Only 7% of SMEs felt that it was easier to operate in South Africa. Labour law changes "will shed jobs"
Business warns that the proposed amendments will increase the cost of employment significantly. Despite being bound up in negotiations for months, the proposed changes to a raft of South Africa's labour laws are still receiving fierce opposition from business, which warned of drastic potential job losses if key amendment Bills go ahead. According to the SBP's regulatory impact assessment, these provisions "will increase the costs of employment". It argued that wage-employment elasticity was estimated at 0.7%. In other words, an increase in the the cost of hiring workers, such as wages and benefits, of 1% is likely to imply a decrease of 0.7% in employment. Given these assumptions, it estimated that at the "very minimum, 215 150 jobs will be lost as a direct consequence of this amendment"
"Thousands will be kicked out"
Red Tape regulations cost the economy R79 billion a year. At least that was the case in 2004, when the government launched a pilot project on regulatory impact assessments for new regulations. For small business the impact is worse, largely because they do not have full-time compliance departments. Estimates show compliance costs of 0.2% on average for big business, verus 8.3% for small and medium-sized enterprises. This was underscored by SBP's SME Centre report (SME Growth Index) in November last year, which surveyed the impact of regulatory requirements of 500 SMEs. The link below is to a podcast of an interview on Tshikululu's "Challenging Change" programme which was broadcast on Radio Today on 26 September. The interview between Tshikululu's Paul Pereira and SBP's Chief Executive, Chris Darroll was in advance of the GIBS and Tshikululu Serious Enterprise Development Workshop. Chris has been invited to present at the workshop on the topic "exploring and exploding the myths of enterprise development work". "Exploding the myths of enterprise development"
The Government of Malawi has, through support from the Commonwealth Fund for Technical Co-operation, recently commissioned SBP to provide technical assistance to develop a Micro, Small and Medium Enterprise (MSME) Policy and Strategy to improve MSME competitiveness and contribute to the country's economic growth in line with the Malawi Growth and Development Strategy (MGDS) and Malawi's Private Sector Development Strategy. The core objective of promoting young entrepreneurs requires a diverse array of approaches. Can the youth agency be the catalyst? The government has made little impact in assisting small business, despite investing in a number of initiatives in the past 15 years to support the sector, according to a report by business environment specialists, SBP.